It is often said that the preparation for individuals to be released from prison and jail begins at the time of incarceration. Although the maxim is ideal, it is not uncommon for people with serious mental illness to return to communities without the support they need to ensure successful community integration. When faced with housing instability upon release, it is difficult for newly released individuals to focus on treatment and their symptoms are likely to become more severe than those they experienced while incarcerated. In addition, for these individuals, there is an increased likelihood to engage in behaviors that may result in further involvement in the criminal justice system. SOAR serves as a tool to help to alleviate these challenges and increase post-release success by assisting eligible individuals to apply for the disability programs administered by the Social Security Administration. The financial benefit and the healthcare associated with SSI and SSDI can help to reduce delay in access to medications and treatment, promote access to housing opportunities, and support the basic needs of previously incarcerated individuals. The SAMHSA SOAR TA Center will facilitate a full-day, on-site implementation meeting with key stakeholders and agency leads. Meeting time will be used to review the existing barriers to assess the resources of the participating stakeholders to identify opportunities to strengthen and support SOAR efforts and complete applications for eligible individuals. Implementation meetings for each agency will be held by June 28, 2019. 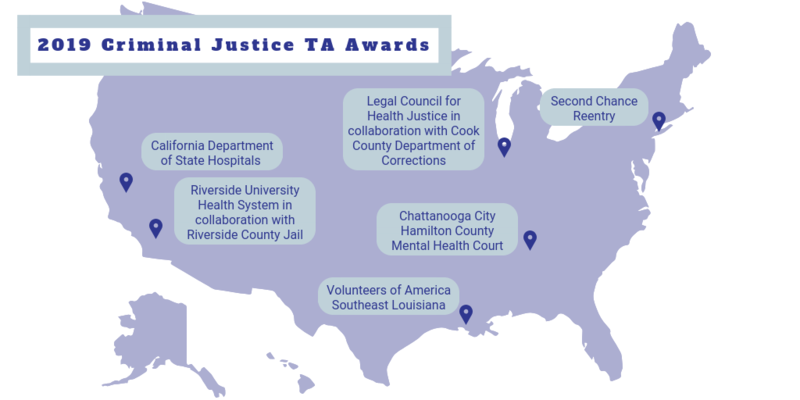 From coast to coast, we are happy to support these agencies in their efforts to provide individuals with access to benefits in pre-release plans in order to promote post-release success. Congratulations!